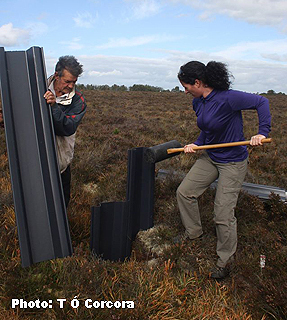 The Girley Bog Restoration Project is a key area of work for the Irish Peatland Conservation Council in 2014 and 2015. The project is a great example of success through community-led conservation. We invite you to watch the short video (left) about the work we are doing on site. In 2015 in addition to completing the restoration works on the bog we are working with other stakeholders in the bog to develop a Conservation Management Plan for Girley Bog. Our first step is to get public opinion on what should be included in the plan. If you would like to participate please take our short survey. 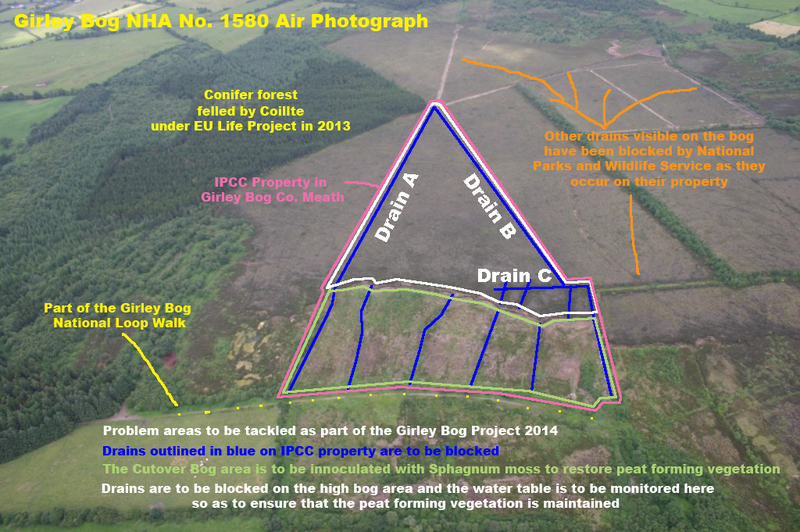 IPCC purchased 8.5ha of Girley Bog in 2014. Girley Bog is an example of a raised bog and occurs in the eastern part of Ireland in Co. Meath. Human impact on Girley Bog has been intense. The site has been drained, turf has been cut and removed, trees are colonising the surface, a forest was planted on its dome and the bog has been regularly burned. Despite all of these impacts, Girley bog still retains an impressive range of bog building Sphagnum moss plants and ecohydrologists have shown that there still exists active raised bog habitat in the centre of the bog which has the potential to spread provided drains are blocked and trees invading the surface are removed. Volunteer your time to help with the work that has to be done. Please contact Tadhg if you would like to join the volunteer team on bogs@ipcc.ie. 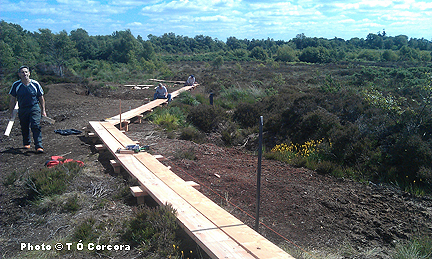 Thanks to the work undertaken by volunteers guided by IPCC’s Conservation Officer Tadhg Ó Corcora, we estimate that we need to construct 40 dams across three major drains on the high bog surface (which we have called A, B and C). Our objective is to raise the water table in the central core area of Girley Bog that is rich in peat forming vegetation and Sphagnum mosses to within 10cm of the bog surface. This will sustain the mosses with water so that they can continue to form peat as they grow and die. Further out from the central areas the slopes on the bog increase dramatically due to the effects of marginal drainage associated with turf cutting, and in these areas we hope to block drains so that we may replenish the volume of water stored in Girley Bog’s peat. Near the edge of the bog we will use sandwich dams to block drains so as to prevent rainwater from running off the high bog into the cutover. Below is a graphic to show the profile of Drain B which lies on the eastern margin of IPCC’s property (see air photograph above). As you can see the difference in height on the bog from the centre to the turf bank is nearly 5.5m over a horizontal distance of just 460m. IPCC are delighted to announce that drain blocking work on Girley is on-going at present and we are happy to report that Drains A and B are blocked and holding water on the bog. 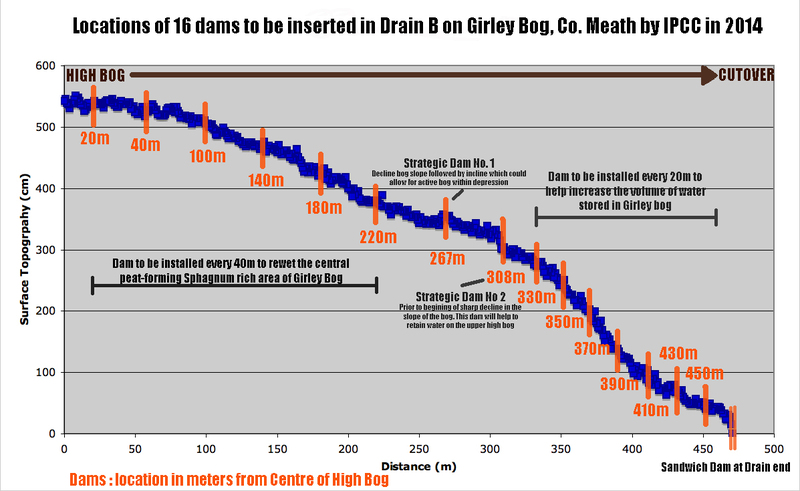 We used plastic drain piling sheets which we bought from Masterpile in the UK to construct the majority of the dams in these two drains. Drain C is a complex of 8 small drains at the edge of the bog. All of these need to be blocked with dams. These will likely be sandwich dams constructed from two parallel plastic dams with a layer of peat in between. 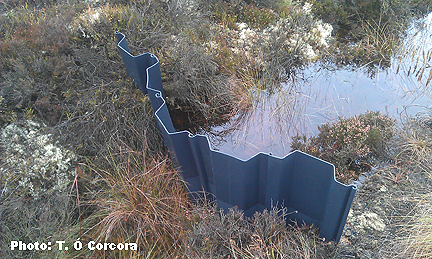 A dam constructed from plastic lumbar holds water on Girley Bog 2014. 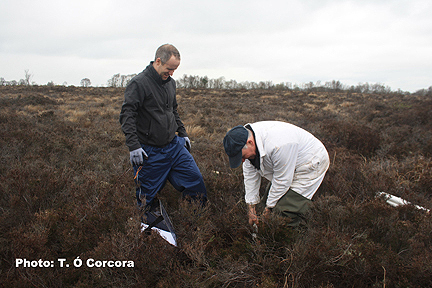 Volunteers innoculate an area of bare, flat, wet peat with Sphagnum moss plants collected from a donor site. The moss plants are then covered with straw to help retain moisture which helps the plants get established. IPCC are delighted to report that we have begun to re-establish the growth of the peat forming moss – Sphagnum on the cutover part of Girley Bog. 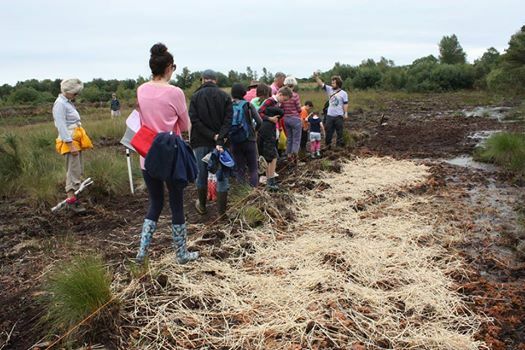 Led by Tadhg Ó Corcora five volunteers innoculated an area of suitable bare peat adjacent to a flooded drain on a former turf spreading ground on the 14th August 2014. 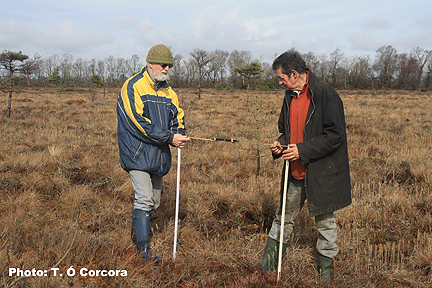 IPCC followed the Sphagnum transfer method of restoration designed by the Peatland Ecology Restoration Group in Quebec, Canada. At present there is no Sphagnum moss whatsoever growing in this cutover area. The water table was raised through backfilling the drains in this part of the bog late in 2013. A high water table (within 10cm of the bog surface) and a very flat surface is needed to create conditions for Sphagnum growth. 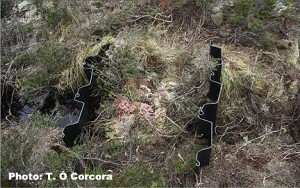 It takes three years for the mosses to begin to grow on bare peat using these methods. Hopefully this work will be a success. IPCC have had a great response to our call for volunteers to help us with the work on Girley Bog. We have organised several work days so far this year. And we have many more planned. So far we have been collecting information about the length and slope of the drains on the bog, we are measuring water levels on the bog and the first dam has been inserted into one of the drains. Here are a selection of photographs showing the volunteers at work profiling drains on the bog and installing water piezometers. There is also a photograph of the first dam consisting of peat and plastic lumbar across one of the drains. During Biodiversity Week in May the MSc Students in Biodiversity and Conservation Class of 2014 from Trinity College Dublin visited Girley to learn about its biodiversity and about the restoration techniques being undertaken there. 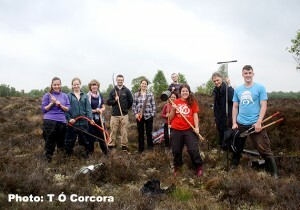 During their visit they helped to remove invasive pine scrub from the surface of the bog. Construct a boardwalk along the perimeter of IPCC’s property to upgrade the national Loop Walk around the site. The photograph opposite taken in July shows the boardwalk under construction on the site. 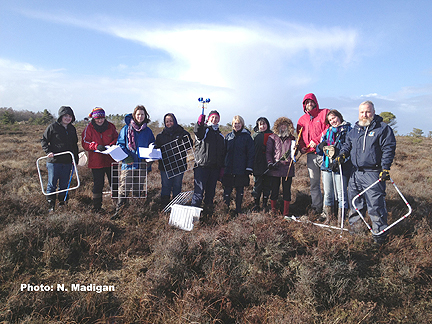 Train educators from the Causey Farm Experience to lead ecology trips to Girley Bog: IPCC have already delivered a great work shop to Deirdre Murtagh and her team of guides in 2014. See photograph below. 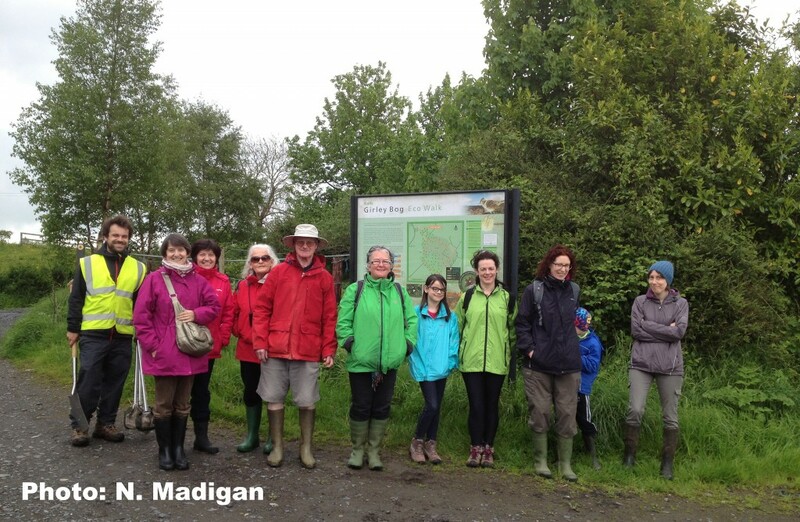 Biodiversity Day on Girley Bog took place on Sunday 25th May from 2-5pm. A small group turned out (seen above in the photograph). They did the loop walk, saw a Buzzard and had tea and treats on the bog. The IPCC’s Volcano Kettle created a great atmosphere. The IPCC Heritage Week open day at Girley Bog on Sunday 31st August from 2-5pm was well attended. The weather was beautiful and visitors enjoyed a good walk around the site. Of particular interest was the Sphagnum restoration work being undertaken on the cutover bog. There are many people and groups involved in the effort to restore the whole of Girley Bog. IPCC’s work is just a snap shot showing what we must do on the piece of Girley Bog that we own. Other stakeholders are working really hard as well to improve the long-term chances of survival for Girley Bog. An informal group of stakeholders are meeting regularly during the year to help us to stay abreast of all the great work that is being done to fix the bog and enhance its biodiversity. The meetings also provide a great opportunity for us to work together on developing a management plan for Girley Bog. The stakeholders include Meath County Council, National Parks and Wildlife Service of the Department of Arts, Heritage and the Gaeltacht, Native Woodland Trust, Irish Peatland Conservation Council, Causey Farm Experience, Coillte Teo and Queen’s University Belfast. IPCC wish to acknowledge and thank all of our supporters who donated to our fundraising appeals to help purchase Girley Bog and to work on this restoration project. Please email bogs@ipcc.ie if you have any questions at all about this project.